Even if today sees the 12th anniversary of the 9/11 attacks, only this time around can it be said that the events of that horrific morning have made an irrevocable impact on the life of the Church Universal. Here's why: only days after the destruction of the World Trade Center, the then-archbishop of New York, Cardinal Edward Egan, was expected in Rome. A year earlier, John Paul II had named the top-flight canonist – one of the Polish Pope's consultants on the 1983 revision of the Code – to the all-important post of Relator General (in essence, the principal discussion leader) of the Synod of Bishops slated to take place the following month, its focus on the role of the bishop in the Third Millennium. Much as the Gotham church remained rattled in the aftermath, the cardinal – who, it should be noted, rushed downtown to (the now closed) St Vincent's Hospital on learning of the attacks to minister to the wounded and first responders while clad in scrubs – made the trip, opening the Synod with the usual pre-discussion Relatio completely in Latin on October 1st. Three days later, though – with Egan facing a raft of criticism at home for leaving, which he later termed "the worst thing that ever happened to me in my life" – a special announcement was made from the dais at the beginning of the morning session. 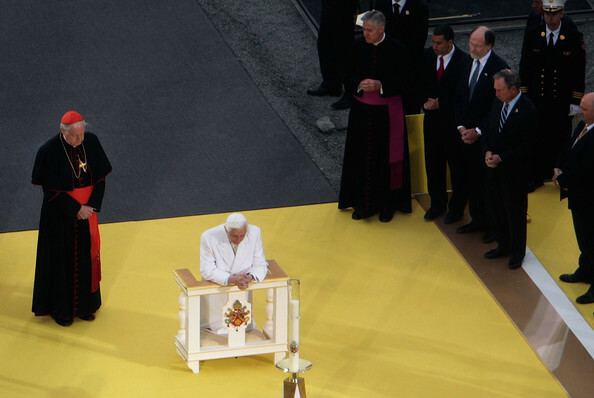 "Eagerly expected by his people" to celebrate a Month's Mind Mass for the lost in St Patrick's Cathedral, the delegates were informed that Egan – shown above with Benedict XVI during the now Pope-emeritus' 2008 visit to Ground Zero – would return to New York. In retrospect, the real kicker would end up being the second part: "so that our work can continue without any changes," it was revealed that John Paul had "appointed a Deputy Relator General in the person of Cardinal Jorge Mario Bergoglio SJ, archbishop of Buenos Aires," who would carry out the task for the remaining three weeks of the Synod. Like Egan, Bergoglio had been given his red hat at the mega-consistory of the prior February, when John Paul created 42 cardinals – an all-time high – in one fell swoop. Yet in a distinct contrast to his New York counterpart – a three-decade veteran of the Rota and the university scene who was given the Presidential Suite of his favorite hotel whenever he was back in town – the low-profile Argentine Jesuit had never studied nor worked in Rome, and generally tended to avoid the place except when summoned under duress. Even so, all of a sudden, the surprise turn at the Synod became Bergoglio's "launchpad" into the spotlight of the global church. In the gathering's wake, the Argentine's performance was deemed so effective that his name would start being floated for key offices in the Curia – a place where he reputedly said "I would die" were he called to work in it. Of course, that wouldn't be the end of the buzz – were it not for his stand-in role in the Aula, the Argentine's name would've attracted far less recognition (and, hence, been a non-starter) at the 2005 Conclave... and without Bergoglio's showing at the last election – burnished by the amplified status which resulted from it – his emergence eight years later as B16's successor simply never would've happened. Though the 266th Bishop of Rome has publicly credited his choice of name to an old friend – the Brazilian Cardinal Claudio Hummes OFM, the retired prefect of Clergy – it's nonetheless notable (and, perhaps, not mere happenstance) that the now-Pope's Synod ascent in Egan's stead took place on October 4th: that is, the feast of St Francis of Assisi. 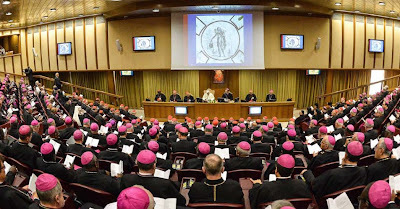 What's more, the Synod has accordingly been at the forefront of the first Pope Francis' mind on the impending Curial reform. On June's feast of Saints Peter and Paul – by tradition, the nonpareil celebration of centralized papal authority – the pontiff's veering off-script to call the church "forward on the path of synodality" sent shockwaves through the old guard he inherited just days after the Pope declared that "we trust" (read: "I intend") that his Synod "will experience further development to ever more aid the dialogue and collaboration among the bishops and, with them, the Bishop of Rome." Just in recent hours, meanwhile, Papa Bergoglio's top appointee to date offered his own homage to the new order as, in a Sunday interview with a Venezuelan newspaper before returning to Rome as Secretary of State, Archbishop Pietro Parolin said that though "the church isn't a democracy... it's good that, in these times, a more democratic spirit is brought about in the sense of listening attentively, and I believe that the Pope has indicated this as an objective of his pontificate. 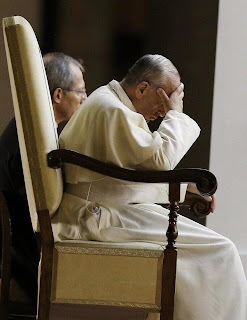 Going further, Parolin explained the concept in play as "a collegial leadership of the church where [the participants] are able to express themselves in every instance." As noted on his late August appointment, the incoming Secretary wrote his doctoral dissertation in canon law on... the Synod of Bishops. In other words, State might remain atop the flow chart as of this writing... but it's pretty clear that, for the key of the shake-up to come, the writing on the wall is already pointing elsewhere.